Carl Larsson was a leading member of the progressive generation of Swedish artists who sought to bring fresh life to the art of their homeland in the 1880s and ‘90s. Although his gifts as a mural painter led to important and lasting public commissions in Sweden (for example the grand entrance hall and staircase at Nationalmuseum [National Gallery of Art], Stockholm), he is best known and loved for the special quality of the paintings he made –mostly in watercolour, a medium of which he was a master- of the life of his family in and around their country house in the village of Sundborn. This house stands today as an internationally unique early example of the Arts and Crafts style in cottage architecture and interior design. Inspired by the beautiful country home he and his wife designed together, Carl Larsson created paintings of compelling artistry and unique charm that have earned him continuing admiration far beyond his native Sweden. As the “illustrator of his own life”, he developed a distinctive style combining a precise flowing line, fresh yet subtle colour, and a strong sense of decorative design into which the intrinsically appealing figures of his beloved wife and seven adorable children are integrated. Rarely has the visual fabric of domestic life been so richly celebrated as in the internationally sought after work of this extraordinary artist. Carl Larsson's international fame as one of Sweden's best-known artists (alongside Anders Zorn and August Strindberg) has had a decisive effect on the country's image abroad in the twentieth century. Crucial to this process has been the mass publication of colour reproductions of the watercolours of his home at Sundborn. One of the most popular publications was “Ett hem” (A Home), begun circa 1890, finished in 1897 and published in 1899, the book included 24 stunning watercolours. Through illustrated books of this kind, Larsson reached a large and devoted public in Scandinavia and Germany during his lifetime, and in the rest of Europe, the USA and Japan from the 1970's. ”Brita, en katt och en smörgås” (Brita, cat and sandwich) was painted, in the interval between completion and publication of the legendary “Ett hem” (A Home), in the summer of 1898. 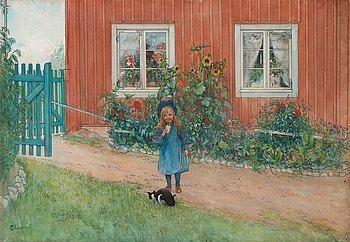 Here the artist has captured his five year old daughter Brita enjoying a sandwich outside her grandparents' house in Sundborn. The endearing watercolour is included in the Hans Erik Börjeson Collection which forms part of Bukowskis Important Spring Sale 2018.